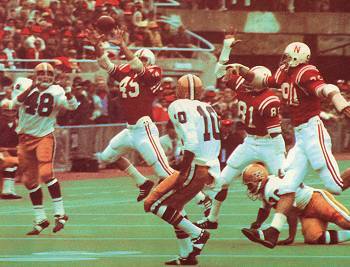 Intercepting a first-quarter pass against Minnesota, 1971. Bob Terrio, recruited as a fullback out of the junior-college ranks in California, was a leader at linebacker for Nebraska on the national championship teams of 1970 and 1971. He helped secure Nebraska's first national championship by intercepting a Bert Jones pass with 45 seconds left in NU's 17-12 victory over LSU in the 1971 Orange Bowl. A year later in Miami, his first-half fumble recovery deep in Alabama territory helped the Huskers breeze to victory over the previously unbeaten Crimson Tide. In 1971, Terrio helped the Blackshirts earn top-five national rankings in rush defense (85.9, second), total defense (202.9, fifth) and scoring defense (8.2, third). 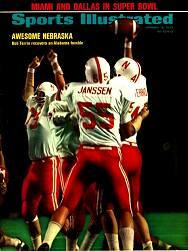 He was one of seven Blackshirts named first-team all-conference that year. 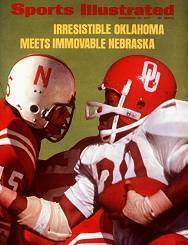 in the 1972 Orange Bowl.